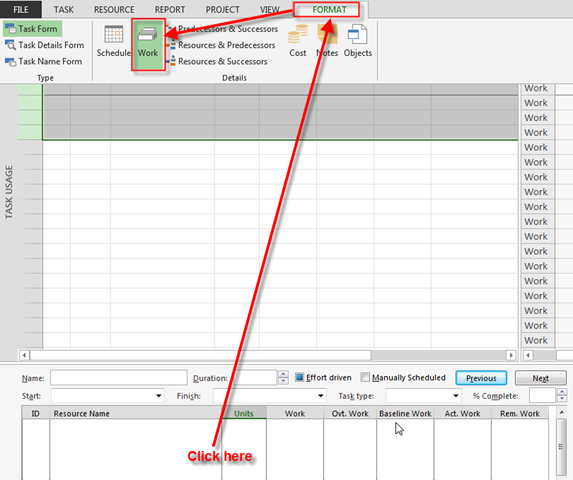 I’ll show how to manage that in MS PROJECT 2013. You should remember this formula for the rest of your life. 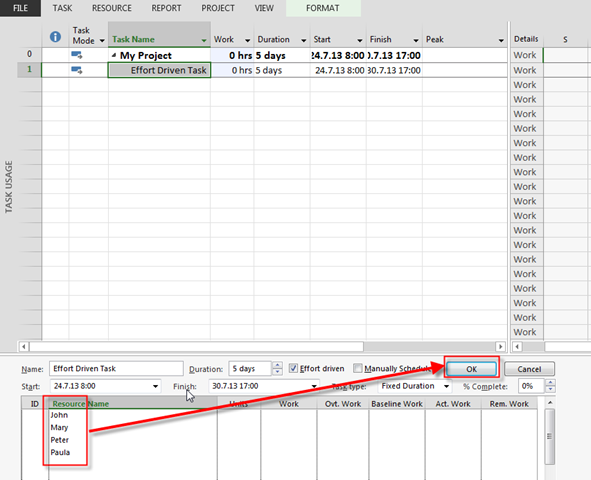 Now suppose that you have an effort driven Task with Fixed Duration! What does it mean? It means that no matter how many Resources will work on the Task, it should have fixed, and unchanged duration. On the other hand, effort driven means that if you add another resource to the Task, all Resources should work less hours. For my First Example I’ll add all Resources (four of them) AT ONCE)! Let’s go back to the formula. 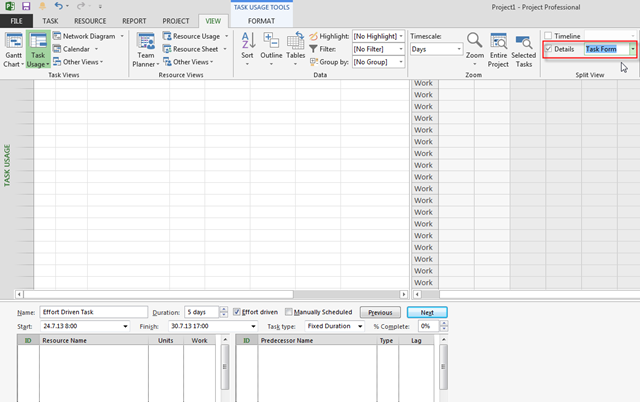 Because I’d added all resources at once, MS PROJECT interprets that like: All four resources must work full time!. So Duration = 5 days, Units = 100%, and Work = 5 days (5 days * 8 hours) * 100% = 40 hours per Resource! As you can see, peak Units and Unit are 100%! 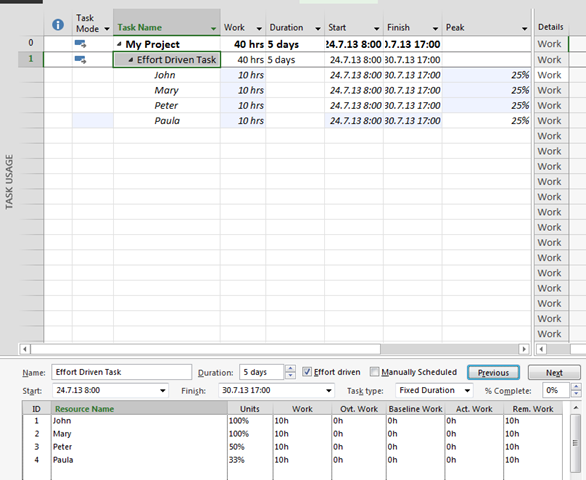 When I add Resources (Mary, after John, Peter after Mary, and Paula after Peter), MS PROJECT works like: You need another resource to finish that Tasks, so because the Task is effort driven, other resource will work less hours per day. Duration = 5 days, Units = 100%, and Work = 5 days (5 days * 8 hours) * 100% = 40 hours for John! And for the Task to complete, 40 hours are enough! After that I added other Resources, and MS PROJECT says: OK, John will split his work with others. So this 40 hours will be split between John, Mary; Peter, and Paula! Duration = 5 days, Peak Units = 25%, and Work = 5 days (5 days * 8 hours) * 25% = 10 hours for John, Mary, Peter and Paula! To conclude, always look at the Peak field. Nenad Trajkovski was born in Zagreb in 1963. year. After completion of Faculty of Electrical Engineering, Nenad has started on the development and implementation of enterprise systems (ERP) in companies of various areas (banks, card houses, production companies, auto industry, wholesale businesses, oil companies, and others). He has extensive experience in working with business processes, people and knowledge in information technology and financial accounting activities. Currently, Nenad works as a consultant for the implementation of business systems, and as Project Manager. He is trainer for Project Management and Risk Management in Microsoft Innovation Center in Varaždin. At WinDays08 conference he has been declared as the best speaker, and his session as the best one. He was among TOP 10 speakers in the Microsoft Sinergija 2009 and at the Microsoft Vzija 2009. Shared first place as the best lecturer at KulenDays 2009 and the PMI Forum 2009 in Zagreb. Regular speaker at the Microsoft Community. On WinDays10 conference Nenad was among the top three speakers; at the conference Microsoft Vision 9 in Skopje between the top 5 speakers as well as on Microsoft Synergy 11 which was held in Belgrade. Certified Accountant, PMP (Project Manager Professional), PMI – RMP (Risk Manager Professional), MCP (Microsoft Certified Professional), MCTS – Microsoft Project 2010 (Microsoft Certified Technical Professional). and MCT (Microsoft Certified Trainer). Well explained, thanks for sharing! 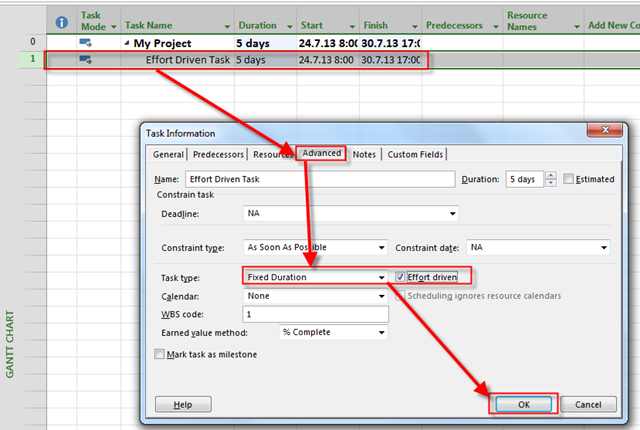 I am facing an issue on MSPS 2013 on fixed task duration when I assign multiple resource to the tasks with the duration fixed and when the resource charge there effort, the task duration gets automatically changed for other resources in the tasks and for the resource who charges in the task. I want to create resources in Ms project 2013 as team based. 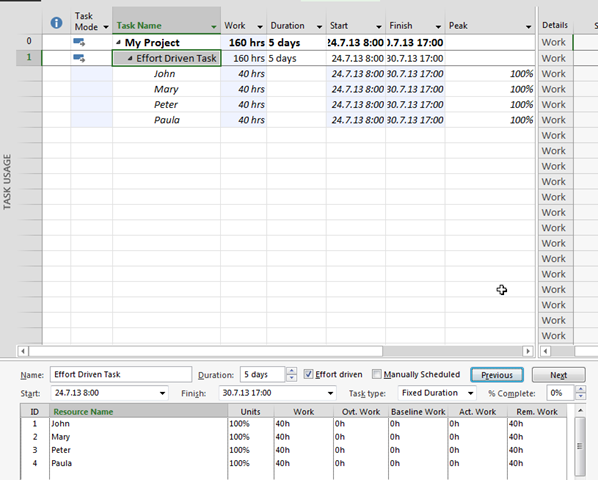 so how do i calculate the team based resources for each task with in the same product. 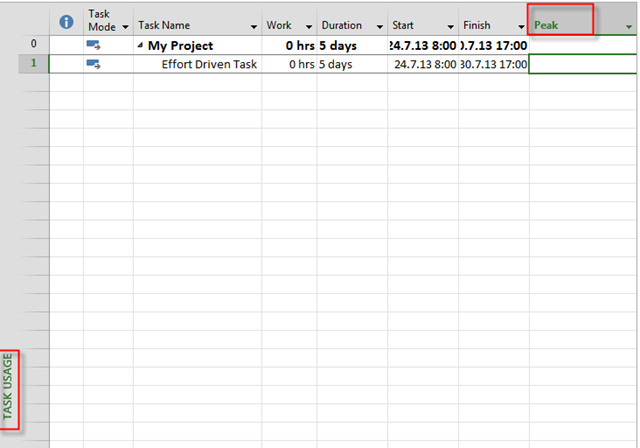 Is there any ways where I can use the team based approach and make sure the hours are calculated automatically.